Here’s a twist: Since the U.S. presidential election, younger Americans who hadn’t typically turned to newspapers for their news are now doing so—at least to a handful of those papers—for political news. According to new Pew Center Research findings, more adults under the age of 50—at rates greater than their elders—said they regularly got news from The New York Times, The Washington Post, and The Wall Street Journal. For example, 44% of adults between the ages of 18 and 49 said they got election news from The New York Times, compared to 23% of adults aged 50 or older, according to the survey. And, 37% of that younger cohort listed The Washington Post as a regular news source, compared to 19% of those over 50. And, 27% of the younger cohort turned to The Wall Street Journal versus 15% of older adults. The survey covered both online and print versions of the various papers. The chart below has the full breakdown. But it doesn’t look like the youth boom helped smaller, local papers. 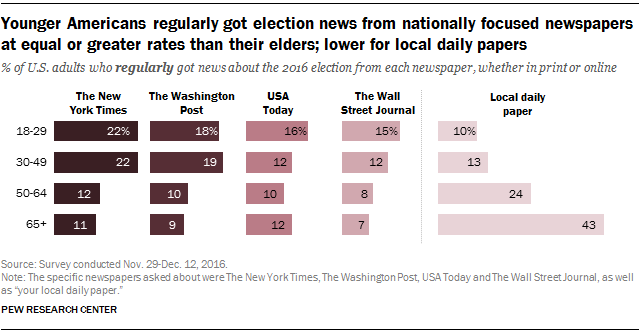 Older adults (67% of respondents) are more likely than younger readers (23% of respondents) to have received election news regularly from local daily papers. The survey—conducted from November 29, 2016 through December 12, 2016—covered 4,183 adults in what Pew said is nationally representative American Trends Panel. While higher readership among young Americans is good news for the major national papers—which have all aggressively pursued younger readership for their digital editions—it remains to be seen how much this helps their respective bottom lines.